Tsum Valley Trek is the perfect choice for people looking for an adventure in a hidden corner of the Himalaya. Tsum Valley Trek journey takes trekkers off the beaten path and offers cultural interaction. High altitude trek to Mu Gompa (3700 mt.). Off the beaten path with verdant forest. Deep gorges and colorful ancient monasteries along the way. Magnificent view of the Himalayas including Siringi Himal, Ganesh Himal and Mt Manaslu (8163 mt.). The remote Tsum Valley Trek is the perfect choice for people looking for an adventure in a hidden corner of the Himalaya. The residents of this highland valley follow a traditional lifestyle with a Buddhist culture. The first section of this Tsum Valley Trekking journey follows the Manaslu Circuit Trail before branching off to a remote valley with a unique lifestyle and spectacular, mountainous scenery. Tsum Valley Trekking was opened to tourists in 2008. This journey takes trekkers off the beaten path and offers cultural interaction and insights that cannot be found on the busier and more commercialized routes. The Tsum valley Trekking path travels through a beautiful landscape that will be unforgettable. Tsum Valley is ideal for adventure seekers looking for something unique and is usually combined with the Manaslu Circuit Trek or it can be done on its own. The gradual rise from a fertile river valley through lush hills allows for proper acclimatization to altitude on the way up to the highlands. Eventually, the scenic trails arrive at majestic mountain surroundings with up-close views of the surrounding Himalaya. The highland Tsum valley is surrounded by the snowy Himalayan peaks including Sringi, Baudha, Him Chuli, and the Ganesh Himal Range and more. To the north of the valley is the border of Tibet. The residents in this Tsum Valley Trekking area have cultural ties Tibet and their customs and traditions adhere to a Buddhist way of life in the tranquil hills. Along the trails are exquisite monasteries, mani prayer walls, and prayer flags and other icons of Buddhist faith. The journey to Tsum Valley begins with a ride through a picturesque landscape. We then hike north up Buddi Gandaki River to Lokpa village where we branch to follow the Shyar River. We ascend to Mu monastery in a breathtaking setting and beyond to Rachen nunnery and much more. The Tsum Valley Trek is ideal for trekkers looking for a thrilling adventure in a relatively unexplored area of the Himalaya with much of the same benefits of natural beauty, biodiversity and cultural richness as the more popular areas but with fewer of the crowds. There is a lot to explore in the Tsum Valley area and it can be easily combined with the Manaslu Circuit Trek, the adventurous Ganesh Himal Trek, and the Ruby Valley Trek as well as the classic Annapurna Circuit and more including Nar and Phu villages and beyond. Please let us know if you have the time and interest and would like to extend your journey to this region and beyond. We look forward to guiding you to all of its highlights. 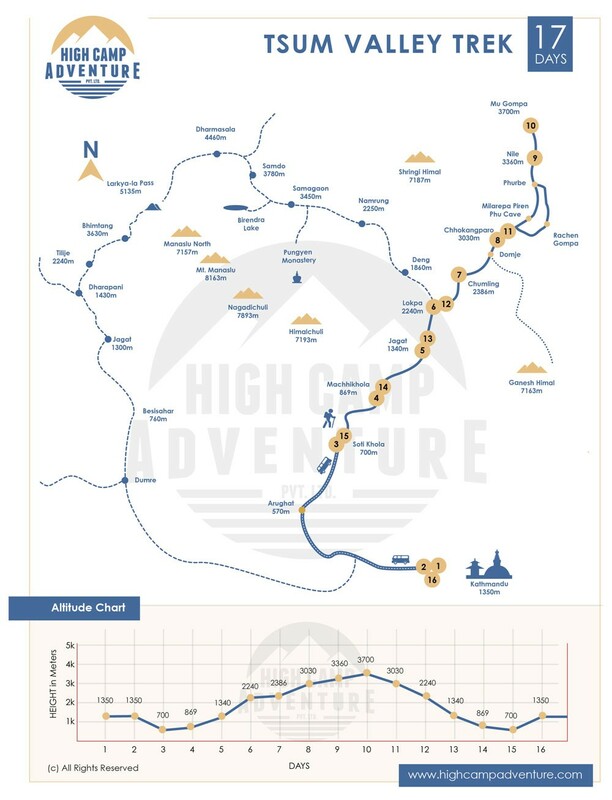 Please Note: Our Tsum Valley Trek has set departure dates from both Pokhara and Kathmandu and this trek can be personalized to accommodate your specific wishes and timetable. We can arrange a trek that combines with the Tsum Valley Trek with the Manaslu Circuit for people with more time and interest. Day 02Trip preparation day (Sightseeing optional ) . Overnight at hotel. Day 03Drive from Kathmandu to Arughat (570 mt.) and further drive to Sotikhola. Driving 8-9 hours. Overnight at guest house. Day 04Soti Khola to Machha Khola (870 mt.). Walking 6 hours. Overnight at guest house. Day 05Machha Khola to Jagat (1340 mt.). Walking 6 hours. Overnight at guest house. Day 06Jagat to Lokpa (2240 mt.). Walking 6 hours. Overnight at guest house. Day 07Lokpa to Chumling (2386 mt.). Walking 6 hours. Overnight at guest house. Day 08Chumling to Chhokang Paro ( 3030 mt.). Walking 7 hours. Overnight at guest house. Day 09Chhokang Paro to Chhule/Nile (3360 mt.). Walking 5-6 hours. Overnight at guest house. Day 10Chhule/Nile to Mu Gompa (3700 mt.) or Nunnery Gompa. Walking 3-4 hours. Overnight at guest house. Day 11Mu Gompa to Chhokang Paro. Walking 7 hours. Overnight at guest house. Day 12Chhokang Paro to Lokpa. Walking 6-7 hours. Overnight at guest house. Day 13Lokpa to Jagat . Walking 5 hours. Overnight at guest house. Day 14Jagat to Machha Khola. Walking 5 hours. Overnight at guest house. Day 15Machha Khola to Soti Khola and drive to Arughat. Walking Overnight at guest house. Day 16Drive back to Kathmandu by bus. Driving 7 hours. Overnight at hotel. Day 17Transfer to airport for your final departure from Nepal. Three nights accommodation at 2/3 star hotel in Kathmandu (breakfasts included). Tea-house lodging during the journey. Departure Note : Please take a look at our fixed departure dates for this Tsum Valley Trek. If they do not fit with your schedule, then please let us arrange an itinerary that ismore suitable to you and your requirements. Tsum Valley Trek is a moderate trek which is fit for those who has the ability to walk 5-6 hours of walking uphill and downhill in a day carrying the personal day pack. Some days are longer with 7- 8 hours of walking as well. Tsum Valley Trek is high altitude trek which demands more physical, however having strong determination, positive vibe and average physical fitness can complete this trek. Some time mental aspect also plays a vital roll in an altitude. Doing some physical exercise a few weeks prior to the trip is better but technical skill is not required for this trek. If you are taking medicine for heart, lung or blood diseases, please kindly consult your doctor and inform to High Camp Adventure. This is a real adventure in high altitude so obtaining a travel insurance is always a good idea for your safety and is highly recommended too. Your travel insurance policy should cover helicopter evacuation and medical expenses in an emergency. There is not any Nepalese insurance company to sell travel insurance policy so you better buy a good one from home. There are some insurance policies which covers only in low altitude below 4000 mt. and some only in high altitude above 4000 mt. So before you purchase it, please double check the policy what it covers and where are you going. Spring (March to May) and Autumn (September to November) are the best months for Tsum Valley Trek. Where normally days are sunny, the temperature is perfect, the sky is clear and Mountain remains crystal. This trek can be done in Monsoon (June to August ) but you should not expect the great weather and Mountain view. You can do it in Winter (December to February) if you are used to with extreme cold temperature.